Home Milko, George, Et Al. The Practical Law Manual To Consumer Legal Affairs. 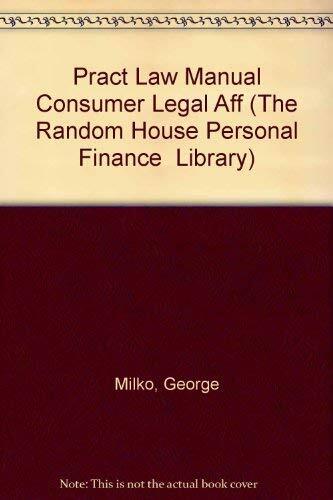 The Practical Law Manual To Consumer Legal Affairs. Ad Infinitum Books has been an Internet bookseller since 1999. We offer both new and used copies of books still in print as well as those that are out of print. The best way to locate books that may be of interest to you on our website is by entering a Keyword; e.g., Cookbooks, Judaica, Abraham Lincoln, Plays, Film, and so on. If there is a particular title you are looking for, we urge you to send us an email. Or else, just enter the title on our website along with any other relevant information, such as how much you are willing to spend to obtain the book. We promise to give your inquiries our prompt attention. Please keep in mind that you can also reach us by telephone at (800) 697-0402 or (914) 664- 5930. We look forward to hearing from you should you have any questions. Priority shipping and handling, $7.95 for first book, and $2.00 for each addl. Customers outside the U.S. please inquire for rates. Address: Mount Vernon, NY, U.S.A.